This article was originally written for The Incubator. Feel free to read the article there and check out other great articles too! This Saturday I was lucky enough to stumble upon Georgetown’s newest flavor-filled establishment. 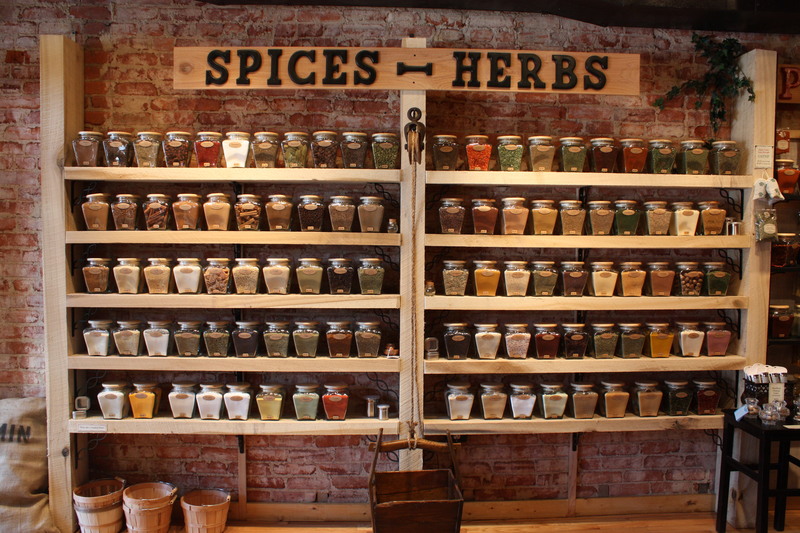 No, not a new restaurant–The Spice & Tea Exchange. 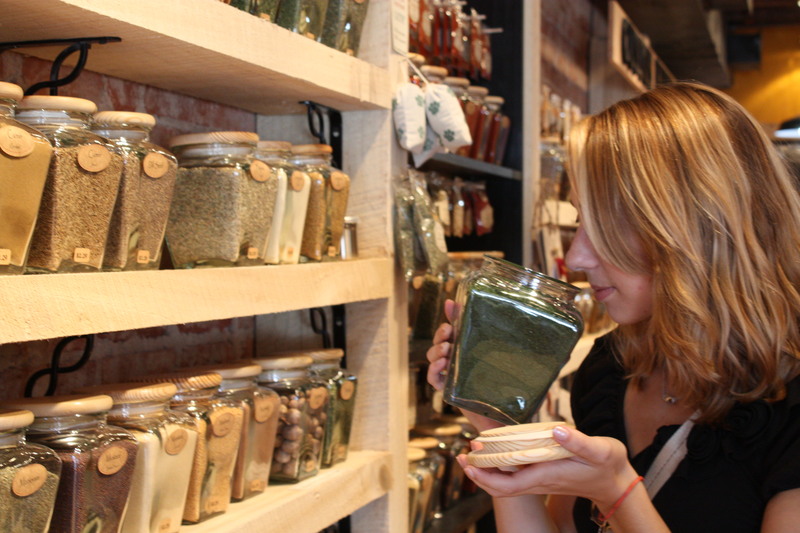 As soon as you walk into The Spice and Tea exchange you feel like you could be walking into a rustic family kitchen in southern Italy. 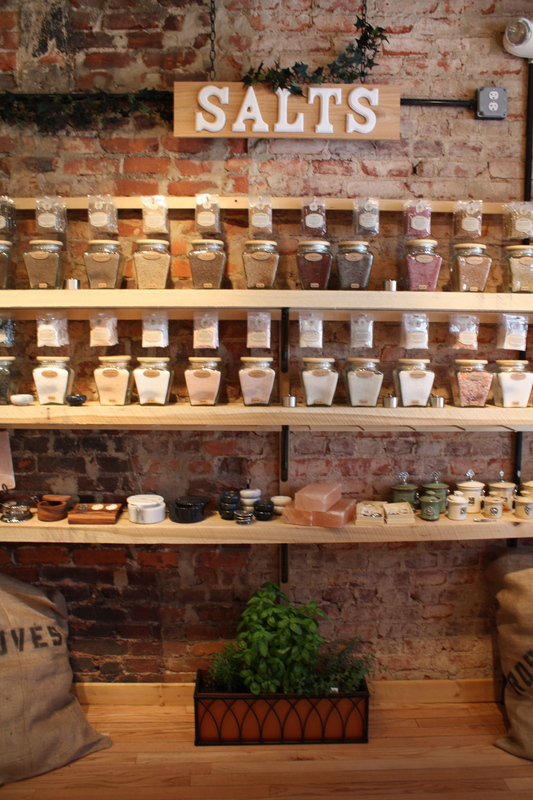 Untreated wood shelves line the beautiful exposed brick walls, housing the most important thing in the store: dozens of clear glass jars, filled with all the spices, herbs, peppers, salts, sugars, and teas you could (and could never even) imagine. Your taste buds (and nose-buds) are in for a treat, as you are invited to open any of the jars you would like to smell what’s inside. You are allowed to taste the salts and sugars, which are harder to judge by smell alone. everything from bay leaf to nutmeg, rosemary to juniper berry. There were at least three different forms of garlic, ginger, onion, and cocoa. One of the staff members explained the three different types of ground cinnamon they stocked (not to worry, there were whole cinnamon sticks too). 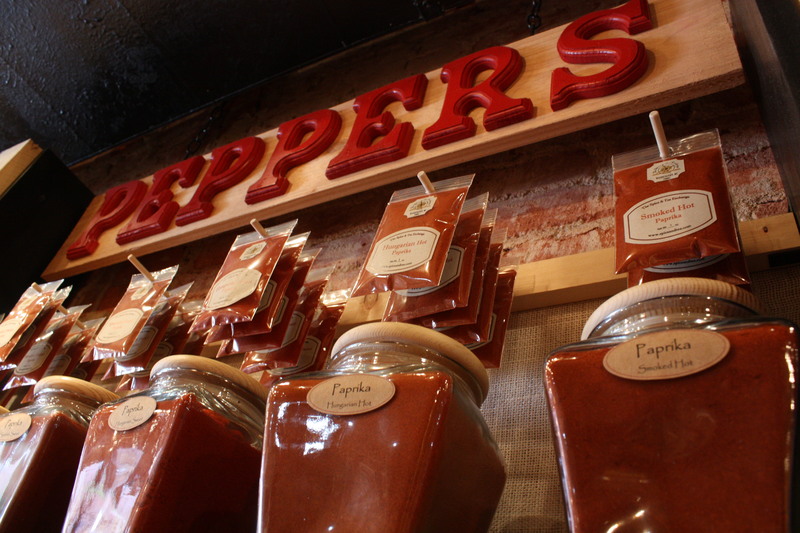 Next I passed the pepper section, which included a gradient of paprikas on the top shelf, a variety of peppercorns in the middle and a whole shelf of ground hot peppers on the bottom (the only jars in the store you aren’t allowed to open – those would burn your eyes). seafood, chili, curry and even some blends for things like popcorn and pumpkin pie. One of their most popular blends, the Tuscanny blend, includes classic Italian seasonings and is supposedly delicious on bread when mixed with olive oil. I was thrilled when I turned around to see their selection of loose leaf teas. They had greens, blacks, herbal and even a few oolongs and white varieties. My roommate and I were also excited to discover they sold lavender, a hard to find ingredient that we had been looking for. with different types of wine. Others were rare sea salts, including one from France that is only harvested by French women at night. I tasted three different kinds of salt: Bolivian Rose salt, Black Lava Sea Salt and Cyprus Flake Salt. It was amazing how different they all tasted. I can’t say I’m enough of a connoisseur to describe the intricacies myself; you’ll just have to go and try them. Now the flavored sugars, that’s what I know about. There were fruit flavors, classic flavors like coffee and vanilla, and even habanero flavored sugar. I tasted the strawberry, which tasted exactly like strawberries. I could imagine it being delicious cooked into shortbread to heighten the flavor in strawberry shortcake. After exploring a bit, I discovered that it was in fact their opening day. 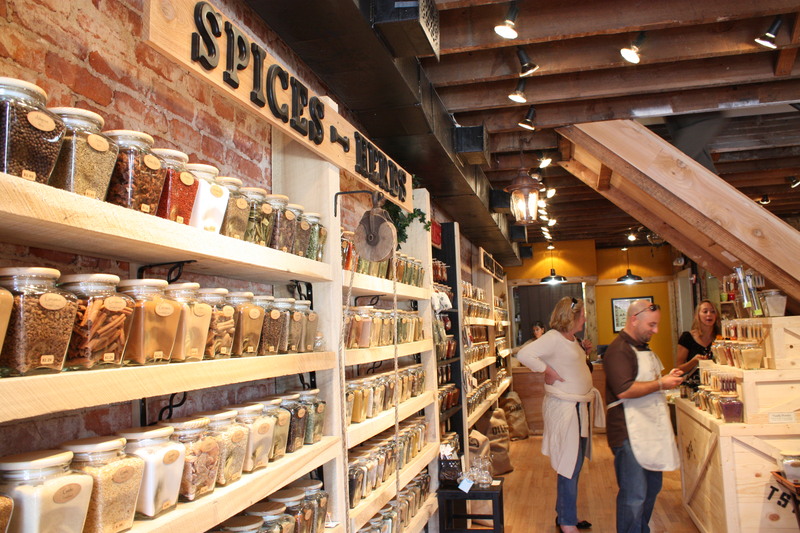 The DC branch of The Spice and Tea Exchange is the fifteenth store in a small chain that is largely based in Florida. It may be a chain, but it sure doesn’t feel like it. The staff is all incredibly friendly, and you can tell it’s a family affair (the owner’s daughter was running around in an apron offering up samples and information about the spices). I think it’s rare that you find a store with great products and a great staff, but this is definitely one of them. sunflower, cactus flower and rhubarb called California Fields, brewed dark and strong with just a whisper of floral flavor. The Spiced Cocoa Mix includes chili powder and pepper, so it warmed me from the inside out. 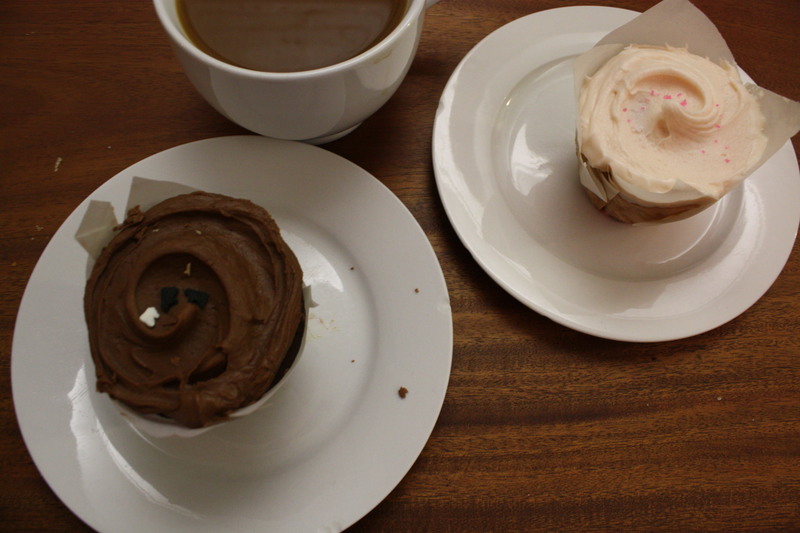 Both of these would be perfect on a chilly fall morning (or when you’re stuck inside during this year’s snowstorm). 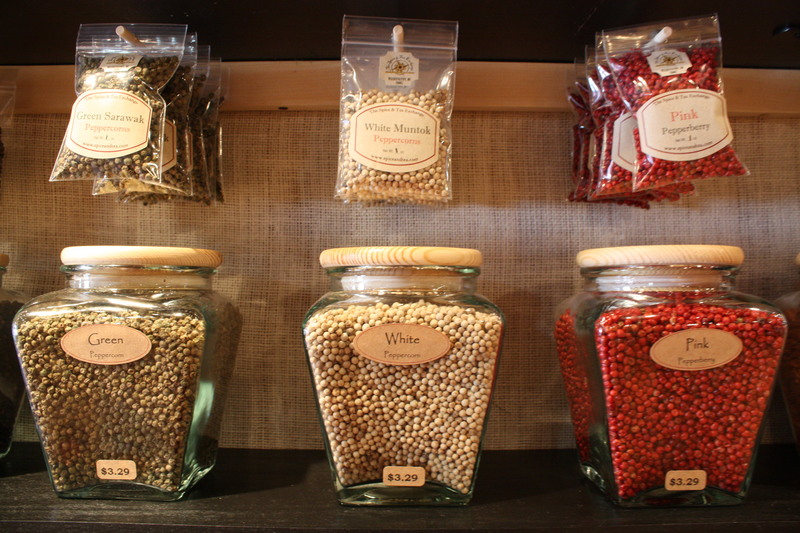 This is a great store for spice novices and experts alike. Down Wisconsin just beyond M Street, this store isn’t far off the beaten Georgetown path. Head down there to explore for yourself. Mention the Incubator article at the register and get 10% off your entire purchase. Enjoy a little spice in your life!